My Magazine was first introduced on the Galaxy Note 3, and it also made its way onto the Galaxy TabPRO series of tablets. It’s no surprise that it found its way onto the Galaxy S 5, but the implementation is a little different. Just like HTC’s BlinkFeed, it now resides on the leftmost home screen. However, My Magazine is really only a gateway into Flipboard whereas BlinkFeed was built from the ground up. My Magazine is more powerful to an extent, but only once you dive deeper into the app (Flipboard). 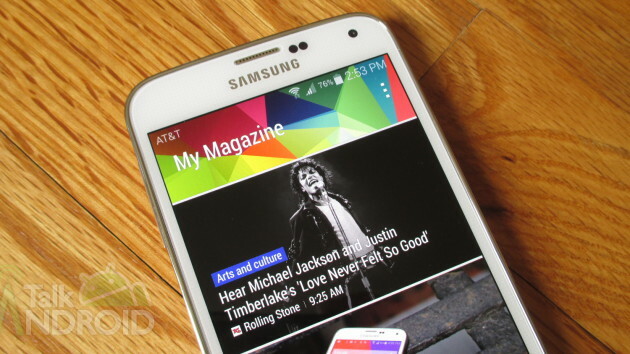 BlinkFeed provides more information from the home screen, which is really what you want. With My Magazine, you have to tap a few more times to get to the stories, but it can still be useful to those that don’t already have another means setup for geting the scoop on what’s happening in the world. So check out the video below showing you how My Magazine works. Now contrary to popular belief you can remove My Magazine from your home screen, and I show you how to do that as well. Unfortunately it’s not as clean as HTC’s implementation with BlinkFeed, but it will be out of sight. See the video after break, and be sure to check out all our Galaxy S 5 guides.